The True Gossip Home / jonas brothers time out new york quit music shania twain miley cyrus dating camilla belle danielle deleasa fans interview questions music tastes / JONAS BROTHERS QUIT MUSIC! 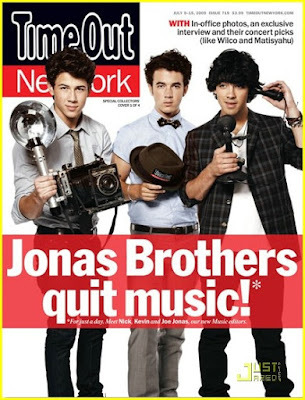 The cover of the August 2009 issue of Time Out New York reads, Jonas Brothers quit music, for just a day...Meet Nick, Kevin and Joe Jonas, our new Music editors. On their broad music tastes: "If it's good, it's good. Rock, pop, hip-hop, whatever it is. You can listen to a Shania Twain song produced by Mutt Lange, and then you can listen to any of his other bands and the production aspect of that is so incredible. You can't deny the power that is Mutt Lange, his vision-from power pop to heavy metal. That's a man who has an open mind to music." On their fans growing with them: "Our audience is growing up with us, but we're always open to having new listeners. Even now, people are like, 'Oh, dude, you're at the top'-and we're like, 'Ahhh, we just started.'" Check out more at TimeOutNewYork.com.